Last week I had the chance to visit one of my favorite cities -- New Orleans. While the weather wasn't real good for the trip (and it will take awhile to get all the photos processed and on the website), I thought it might be nice to go back to 2008 and my first visit to the Crescent City. 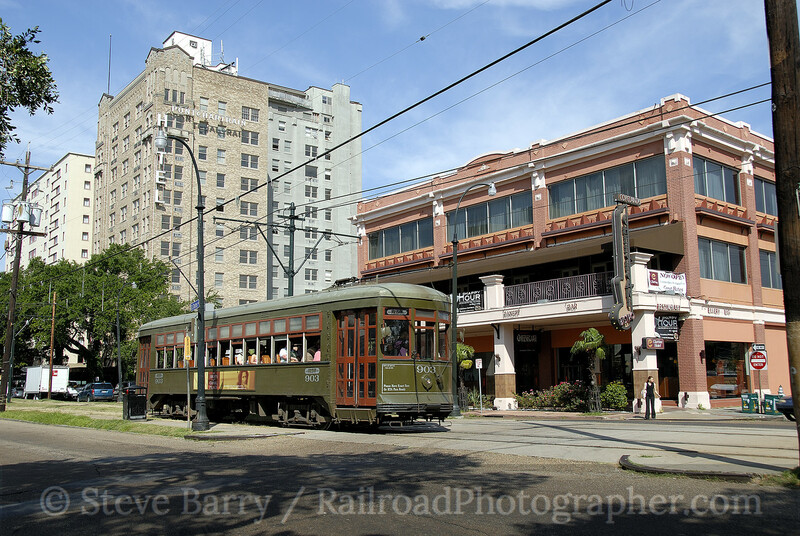 Scenes like streetcars parading past the Ponchartrain Hotel (above) show how charming the city can be. In 2008 New Orleans was still reeling from Hurricane Katrina. We headed out to the area along Lake Ponchartrain on the city's east side, going through the Ninth Ward which was still full of houses with the markings painted on by post-Katrina rescue workers. In 2011, much of the same area has been repopulated, and long stretches of deserted houses (at least in this area) are a thing of the past. 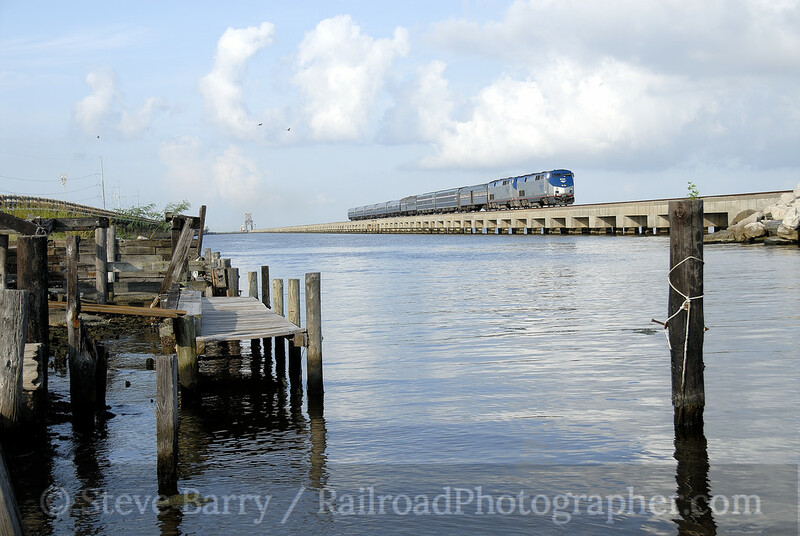 It is here, where Norfolk Southern crosses Lake Ponchartrain on a long bridge, that we caught Amtrak's Crescent on its early morning departure entering Slidell. 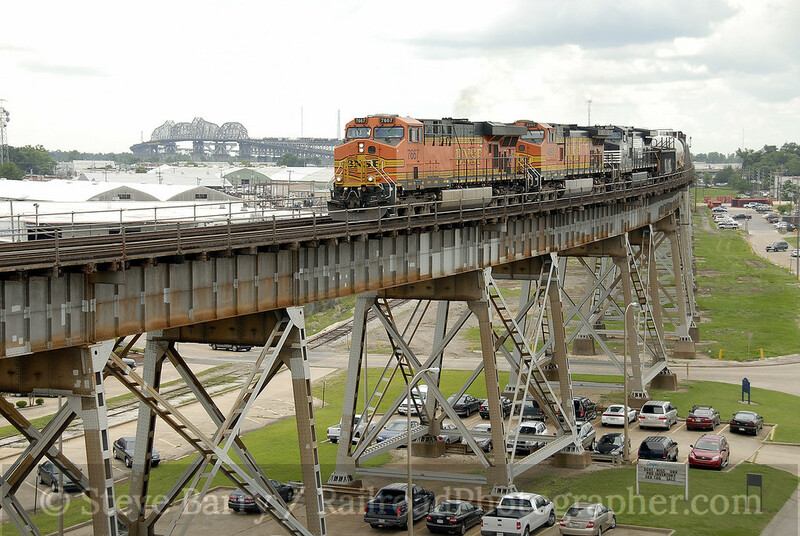 One of the most famous railroad landmarks in New Orleans is the Huey P. Long Bridge over the Mississippi River. The railroad stretches 22,996 feet across the bridge, while the adjacent highway lanes are a mere 8,076 feet long as they drop to the ground faster than the railroad does. Crossing the bridge by car is quite the experience, as the grades are remarkably steep and the lanes remarkably narrow at nine feet across (two lanes flank each side of the railroad). By the time we visited in 2011, a lane widening project was well underway. There are still a handful of towers scattered around New Orleans, but the only two still open are at each end of the Huey Long Bridge; the pair are appropriately named East Bridge Junction and West Bridge Juncton. 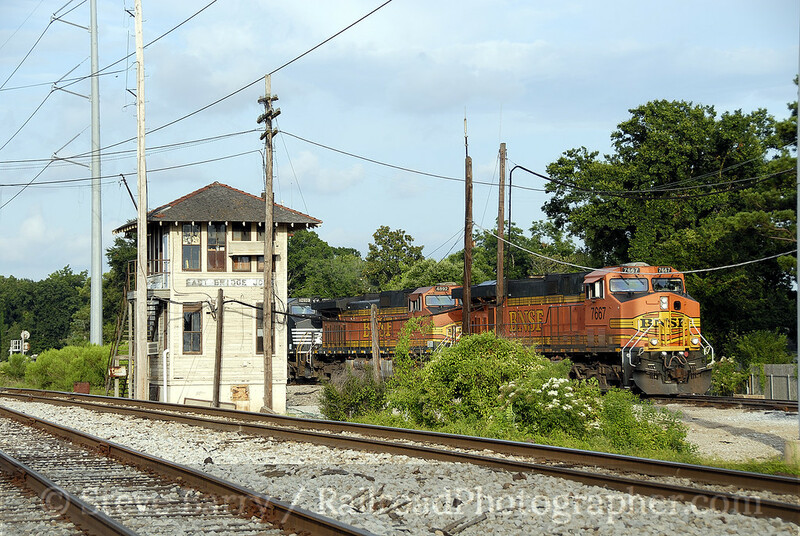 The railroad on the bridge is the New Orleans Public Belt, but power from virtually all the U.S. Class I railroads can be seen crossing the structure. And, of course, there are the streetcars of New Orleans. 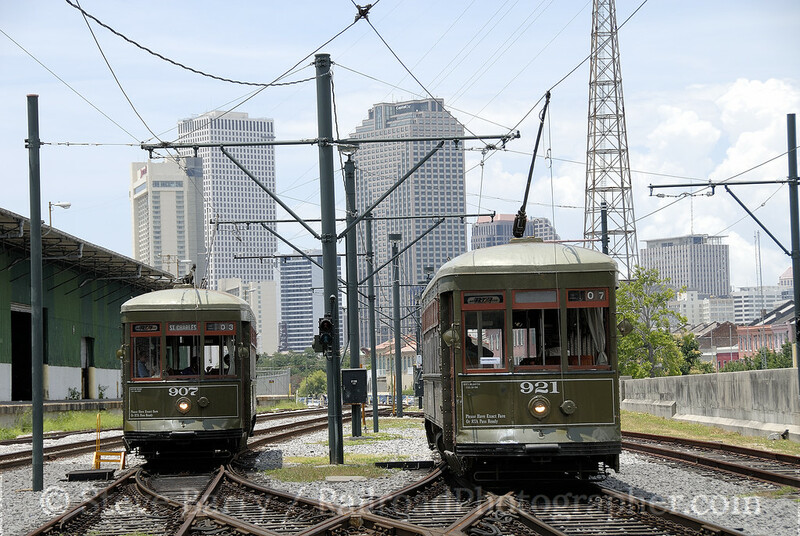 After Katrina, the two symbols of New Orleans that were immediately restored to show the city was still alive were the Superdome and the streetcar system. The St. Charles Line was heavily damaged by Katrina, but its carhouse was spared; conversely, the Canal Street Line survived the storm with minimal damage, but its carhouse was submerged, damaging all the bright red cars used on that line. Thus, on our 2008 visit we found St. Charles cars pressed into Canal Street service. In 2011 we found red cars once again on Canal Street. So there's a quick look back at the June 2008 trip to New Orleans. Down the road we'll take another look at what we found in February 2011.